A QANTAS check-in attendant was slapped and another worker collapsed from stress in a bad start to the holiday season at the airline's Brisbane domestic airport terminal. An information desk officer was also removed from her post after being abused by passengers as tempers frayed in long queues, the Courier-Mail reports. Australian Services Union branch secretary Julie Bignell said it was a timely reminder of what was ahead for Qantas' customer service staff. "There's still a couple of weeks before it gets really bad and already you've got passengers attacking workers," Ms Bignell said. "We have asked Qantas to put up signs stating that it is not acceptable to abuse staff and that attacking staff is illegal." She said the female passenger who slapped the male check-in attendant across the face was not allowed to fly with the airline. You would be charged with assault if you did that on the street. But if you do it at the airport there's a level of acceptance because of the queues," Ms Bignell said. 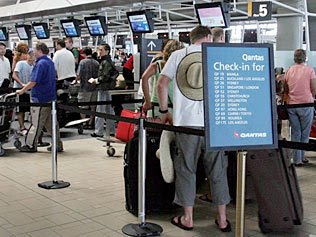 Last year Qantas agreed to hire 90 more staff for Brisbane Airport, which is now Australia's second busiest airport. The decision came after staff were spat on and abused when they left their posts to assist an elderly woman who collapsed and died in a long queue. Ms Bignell said staffing levels had improved but despite the boost to frontline employee numbers there were still staff shortages and problems. "A lot of people still aren't trained," she said. Yesterday's slapping incident was the first time a worker had been physically assaulted, Ms Bignell said. A Qantas spokeswoman said she could confirm there was an incident involving a staff member and a passenger which resulted in the police being called. "As a result the passenger was refused carriage on Qantas for 24 hours," the spokeswoman said.